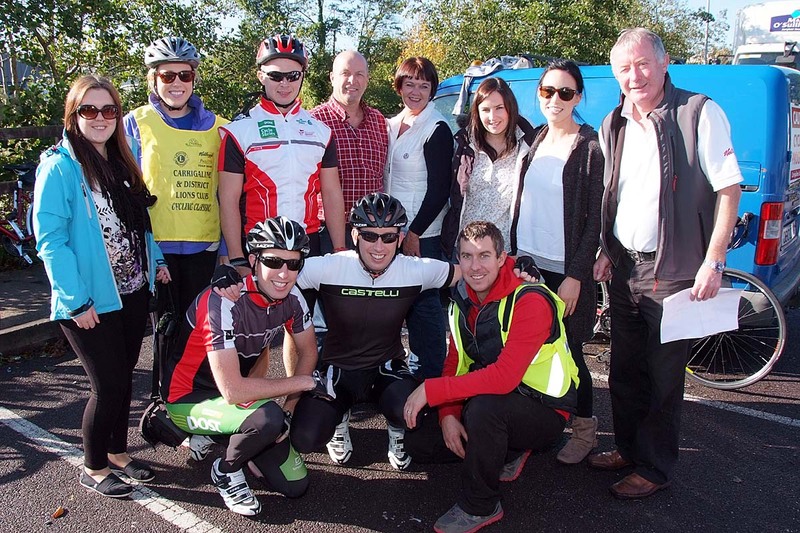 Kerry Group have donated €10,000 towards the Carrigaline Lions Youth Centre Project. 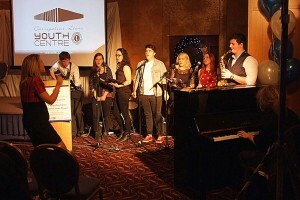 The aim of the project was to build a new state-of-the-art Youth Centre to serve the young people of Carrigaline. The €1 million project was financed with significant grants from SECAD and Cork County Council, donations from corporations and individuals and with a loan of €300,000. A major fund-raising drive is now on to raise the remaining funds needed to repay the loan. The building of the new Youth Centre has now been completed and various youth organisations are planning to start using the new centre in the coming months. 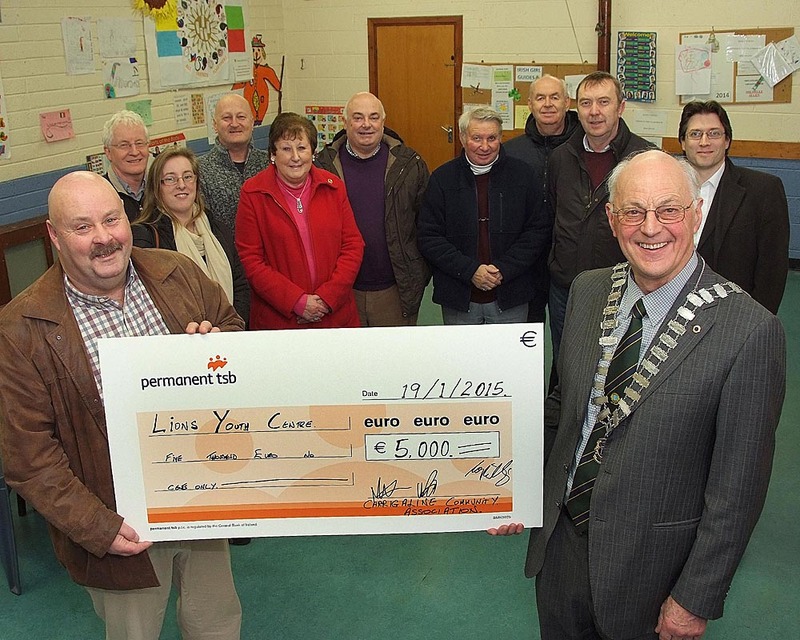 Dan Benson, Kerry Group, Carrigaline pictured presenting a cheque to support the Carrigaline Lions Club Youth Centre Project to Sean Duggan, Project Chairman. 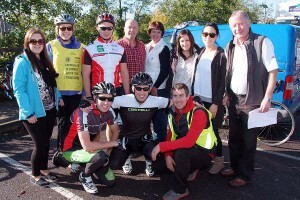 Included also are Youth Centre Committee members Brian Thoma, Colm O’Rourke and Kieran McNamee. 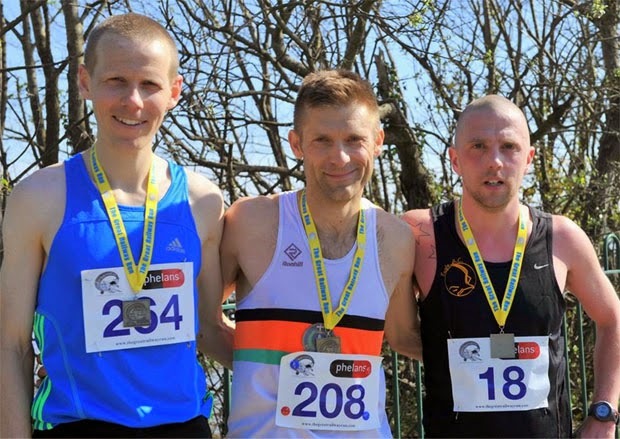 The 2015 Great Railway Run was held yesterday (18th April) and attracted almost 600 runners this year. There were 247 in the 25k from Cork to Carrigaline, 237 in the 10k from Monkstown to Carrigaline and 100 in the 5k from Shanbally to Carrigaline. You can view photos of the event on our facebook page here. 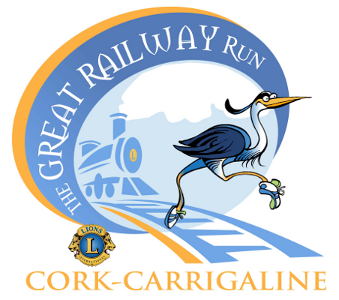 Most of the funds raised will be going towards the new Lions Youth Centre Project in Carrigaline with the remainder going to help other Lion’s Club charities and to support the Carrigaline Roadrunners Association. Over 100 volunteers were involved in the organisation of the event which ran very smoothly and received very positive feedback from many of the participants. Thanks to both the volunteers and participants for making the event such a success and helping to raise funds for the Youth Centre and other charities. 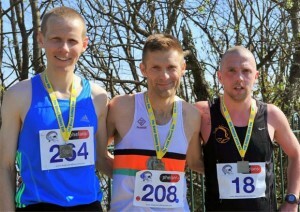 Read a report on event at the Cork Running Blogspot here. 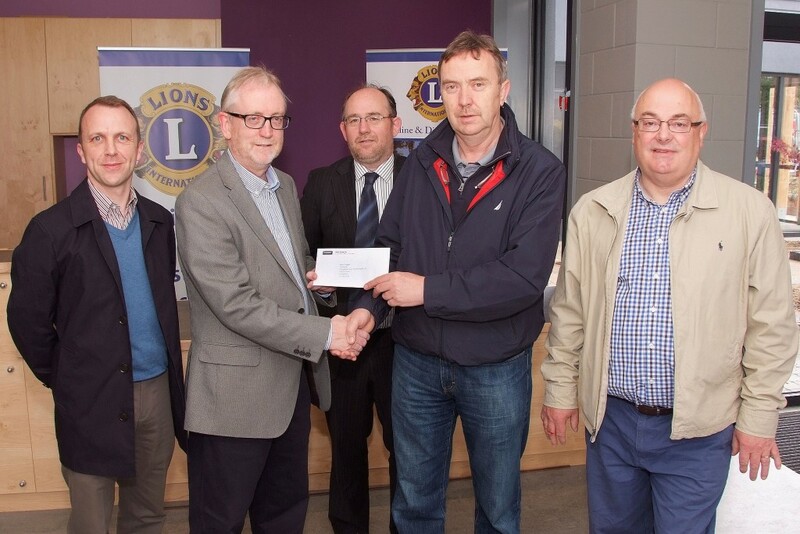 Michael Wall, Chairman of Carrigaline Community Association recently presented a cheque for €5,000 to Patrick Coughlan, President of Carrigaline & District Lions Club to support the Lions Club Youth Centre Project. The new Youth Centre is currently under construction and expected to open in late Spring 2015. On behalf of the young people of Carrigaline, the Lions Club would like to send a big Thank You to the Community Association for this generous donation. Included in the photo are members of the Community Association and Lions Club Members. Registration for this years Great Railway Run is now available here. See http://thegreatrailwayrun.com for full details. 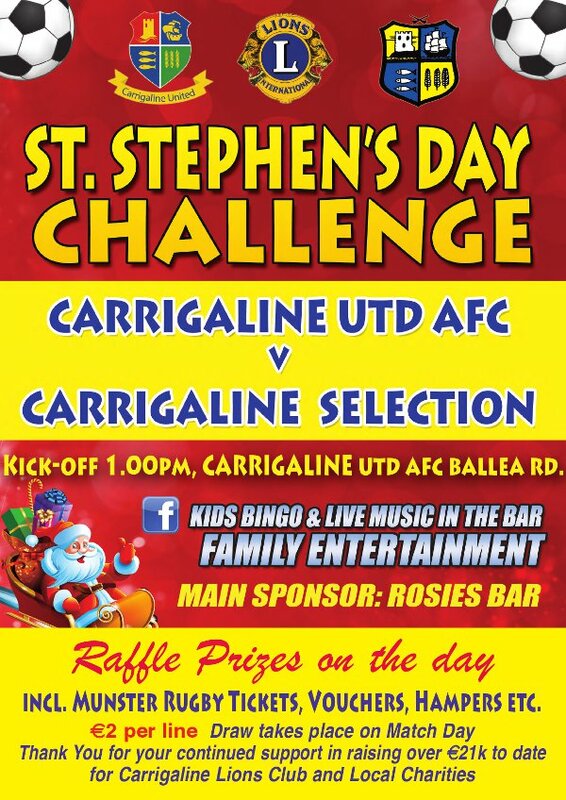 The St. Stephens Day Challenge match is by now a highlight on the fixture calendar for both Carrigaline United AFC and Carrigaline Hurling & Football Club. 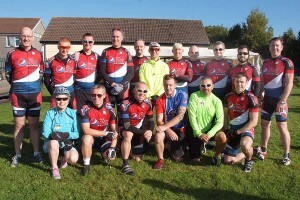 This event, now in its 9th year has raised over €21,000 with all monies raised on match-day going to the Local Carrigaline Lions Club and then distributed to local charities. Kick-off in the ladies game is at 1pm. Next up are the legends teams (Golden Oldies) which includes past and present players from both clubs. The final match of the day will be between the Senior teams from both clubs, who will be joined by Cork footballing captain, Michael Shields; ex- Cork City now senior manager with CUAFC, Greg O’Halloran; former CUAFC players Mark O’Sullivan now of Cork City FC and Kalen Spillane now of Sligo Rovers FC. Off the pitch and in the clubhouse at 3pm for those of a younger age there will be Kids Bingo with prizes galore, along with other kid’s activities. There will also be live music in the bar from 4:30. For the past few years we have incorporated a prize raffle draw. This year the main prize are two Munster tickets plus many more vouchers and hampers to be won. 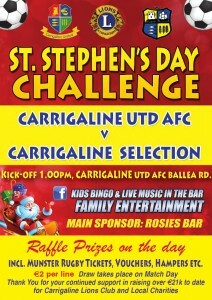 Lines cost €2 with the draw taking place on match-day…..
We would like to thank all our generous sponsors who include – Main Sponsor – Paddy Cronin of Rosie’s Bar, Carrigaline, KWP Print our print Sponsors and all media resources for covering this event and to all of the local business for giving prizes for the draw. We would also like to sincerely thank all three Clubs – Carrigaline Utd AFC, Carrigaline Hurling and Football & Carrigaline Lions for their continued support of this event. Carrigaline & District Lions Club held a launch event for the new Carrigaline Lions Youth Centre Project on Thursday, 13th November in the Carrigaline Court Hotel. Over 100 people attended the event including representatives from a large number of clubs and organisations in Carrigaline, particularly those involved in working with youth. 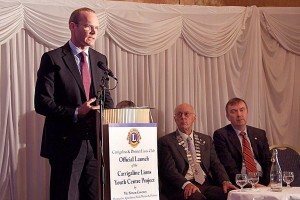 Guest of honour was Minister for Agriculture, Food and the Marine, Simon Coveney T.D. who spoke about this exciting development for Carrigaline. Other speakers included Cllr. Seamus McGrath representing County Mayor Alan Coleman; Chairman of SECAD, John Horgan; Chairman of Carrigaline Lions Youth Project, Sean Duggan and Lions Club President, Patrick Coughlan. The speakers were followed by a presentation from Kieran Barry of KJB & Associates which provided some insight into the design of the building and included a virtual tour of the new facility. In keeping with the youth theme of the evening, it was great to have a group of young musicians from Carrigaline Community School called Melodramatix who provided the entertainment. Their final song Feeling Good with the line “it’s a new dawn, it’s a new day” was particularly appropriate. Carrigaline is a satellite town to Cork City which, in little over a generation, has developed from a village that had a population of circa. 1,000 people to a town of 15,000 people with a lack of developed facilities for its young people outside the realm of sport. Currently the youth of Carrigaline have no one location to safely spend time in, they are reduced to loitering in shopping centres, car parks or in Cafe’s which in turn can lead to antisocial behaviour, however minor. This problem is exacerbated during times of bad weather and short winter days. The Lions Club of Carrigaline believe that young people in our community deserve and need a dedicated building where they can spend time in a safe, secure environment that would also act as a conduit for educational programmes in areas such as mental health, music, entrepreneurship, nutrition and more. The Carrigaline Youth Centre will provide state of the art facilities for the young people of Carrigaline. The project to build the Youth Centre was initiated and is being managed by the Carrigaline & District Lions Club. Over the past three years, members of the club have spent a great deal of time and effort in bringing the project to its current state. This included determining requirements, finding a site, getting funding, commissioning design proposals and obtaining planning permission. Construction started in June 2014 and the building is expected to open in Spring 2015. Over the next few years, the Lions Club will continue to work hard at raising the necessary funds to service the capital debt of almost €300,000 for the building through a combination of looking for corporate donations/sponsorship and raising funds from various charity events. 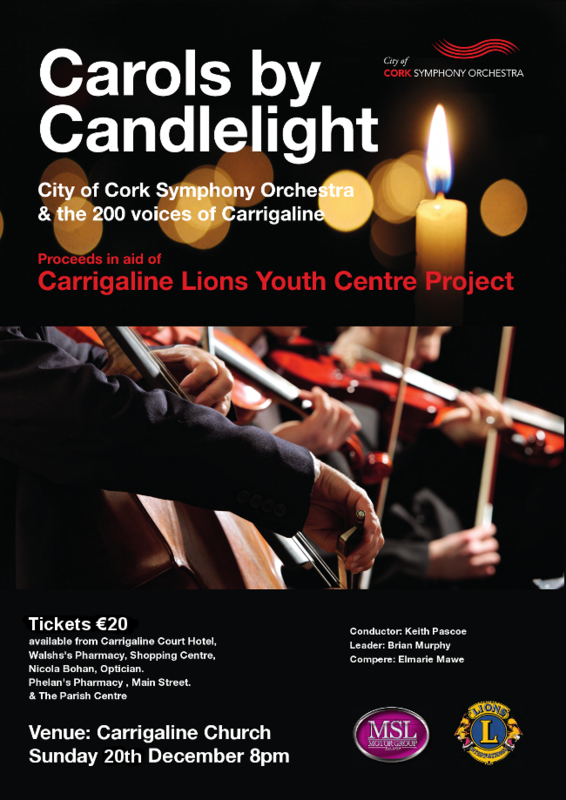 An exciting array of upcoming events are being planned to raise funds for the project including a Carol Concert with the Cork Symphony Orchestra in the Church of Our Lady and St. John on Sunday, December 21st at 8pm. The Carrigaline Lions Club looks forward to the continued support of the residents and business community in the Carrigaline area together with the ongoing assistance of the industries based in the Lower Harbour. 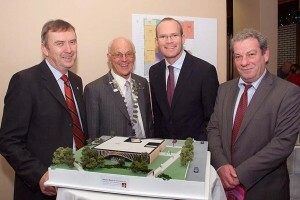 In addition to fund raising, the Lions Club will work with partners such as Foróige and other interested groups to put in place a robust and responsive management structure for the new Youth Centre to ensure that its potential is maximised and that it caters for the needs of young people in Carrigaline. 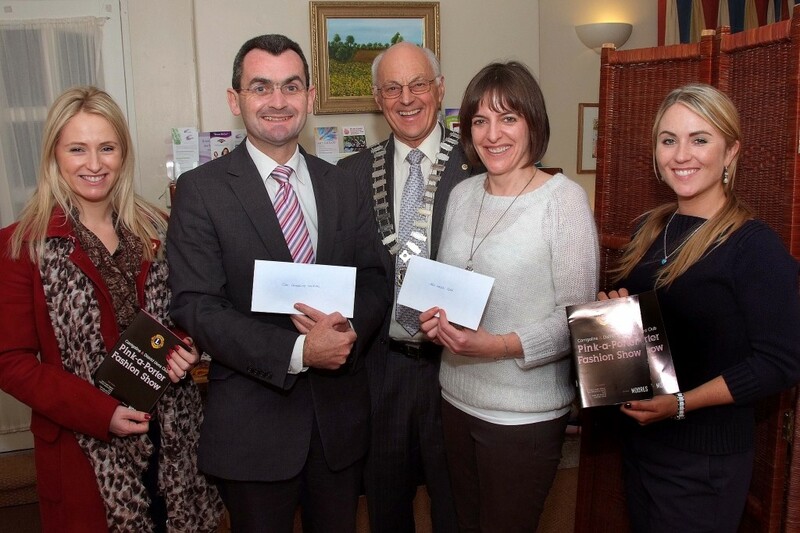 Pictured at the Presentation of funds from the proceeds of the recent Carrigaline & District Lions Club Pink-a-Porter Fashion Show at Cork Arc House Cancer Support Centre, were from left, Catherine O’Callaghan, Fashion Show Joint Co-Ordinator ; Prof. Seamus O’Reilly representing the Breast Cancer Liason Nurse Group at Cork University Hospital ; Patrick Coughlan, President, Carrigaline & District Lions Club ; Hilary Sullivan, Head of Fundraising, Cork Arc House Cancer Support Centre and Áine Dunleavy, Fashion Show Joint Co-Ordinator. 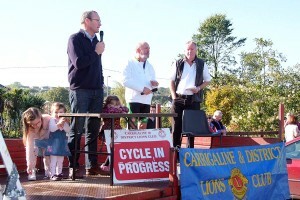 The annual Carrigaline Lions Cycle Classic was held on Saturday 11th of October. 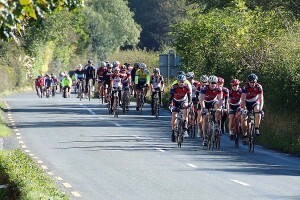 The cycle started in Carrigaline and finished in Kenmare. 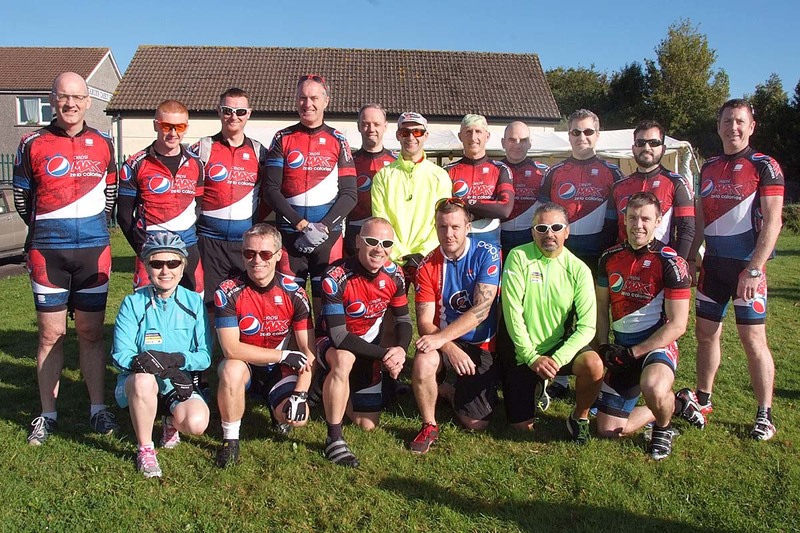 On Saturday evening, cyclists and their guests attended a dinner at the Kenmare Bay Hotel followed by some well-earned refreshments later. Proceeds of the event will go towards Marymount hospice, the new Carrigaline Lions Youth Centre and other local charities.